I've decided to be a good witch and share one of my secrets with You. I've held onto it long enough, and now it's time for it to be set free, so that others may enjoy this better, improved, damnably delicious and enchantingly easy recipe for the good old leek and potato. It's one of the classics, the soup that everyone knows about. But how many times have you actually made it? 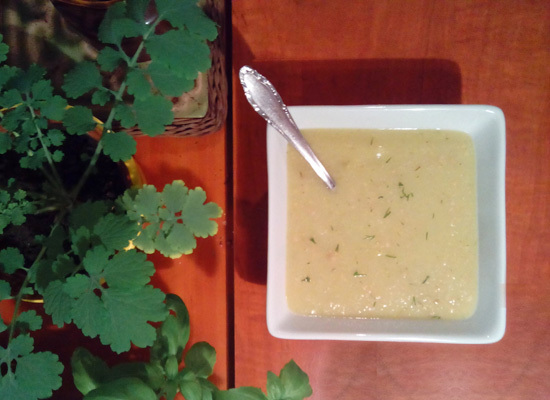 The humble leek and potato is often passed over in favour of other, more exotic recipes, which is too bad, considering how delicious it can be. You only need to add The Secret Ingredient. The Secret Ingredient! - a handful of unsalted peanuts, or a spoonful of peanut butter. Put some oil into a pot. Peel and dice the potatoes. Chop up the leek and stir-fry in the pot for a few minutes on low heat, adding a bit of salt and as much pepper as you like, which should not be too much - this is not meant to be a spicy soup. 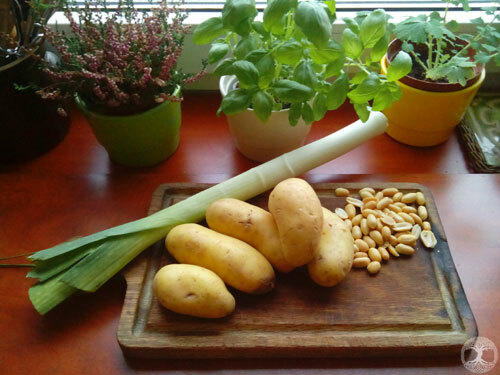 Chop up the peanuts a bit, if you're using them - take a sharp, heavy knife and use it to carefully crush the peanuts, don't go at them like you do with onion or they'll ricochet all around the kitchen - and add them to the leeks. Stir fry a few minutes more. (If you prefer peanut butter, just add it to the leeks and stir, don't fry overmuch.) Add the potatoes and water, mix it all up, toss in the laurel leaf and some strands of dill. Leave it to boil, still on low heat (low heat is important for this recipe, both the leeks and the peanut butter can burn easily), for at least an hour. Add more salt or pepper if it needs them, but be careful not to smother the peanut taste. Use the blender to give it a smooth, creamy texture. You can sprinkle some fresh dill on top, too. Of course I didn't make it myself - I can't do that sort of thing. This is made on blogger, using a free template which I've only tweaked a bit. I used wordpress before that. Blogger is rather simple in comparison, with far less options and things. But when my wordpress blog got hacked, wordpress was like "we don't care. But we would LOVE for you to buy our premium product!" So I said, so long, wordpress.